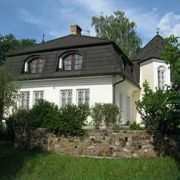 Small rural mansion type villa in the picturesque village at the southern foothill of Iron Mountains. Accommodation … More » in luxuriously equipped apartment. Every apartment for max.6 persons. In appartaments are kitchen, living room and 2 bathrooms and 2 bedrooms. The sunny terrace, large garden, parking.